Summit of determination? Or incapacity? 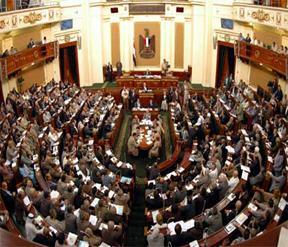 The two inaugural sessions of the newly elected Shura (consultative) Council—the upper house of Egypt##s Parliament—were held yesterday. As per the March 2011 Constitutional Proclamation, the oldest of the 270 elected members, Mohamed Hassan al-Meleigi, presided over the sessions. The elected members took the constitutional oath, again several of them added the clause “as long as it does not violate the sharia of Allah” as a number of People##s Assembly MPs did when they took the oath. Even though Meleigi tried to stop that practice, warning that it was highly irregular, the MPs persisted. The Muslim Brotherhood##s Freedom and Justice Party (FJP) MP Ahmed Fahmy unanimously elected as Speaker of the Shura. Fahmy has been a professor with the Zaqaziq University since 1993. At 105 out of a total 180 elected seats, the Muslim Brotherhood##s FJP won the lion’s share of the Shura Council, followed by the Salafi al-Nour Party with 45 seats. According to the Constitutional Proclamation, as soon as a president is elected, he appoints the remaining one third of the Shura Council##s seats. Next Saturday, both houses of the Parliament conduct a joint session, which will be attended by Field Marshall Hussein Tantawi, Head of the Military Council as well as other representatives of the ruling Military Council.